Nepal Lily is a gorgeous, but rarely seen, bi-colored Himalayan lily. It grows up to about 1 m high, usually less. The bulbs are stoloniferous, and for newly planted bulbs, the shoot will often come up some distance from the planting spot. 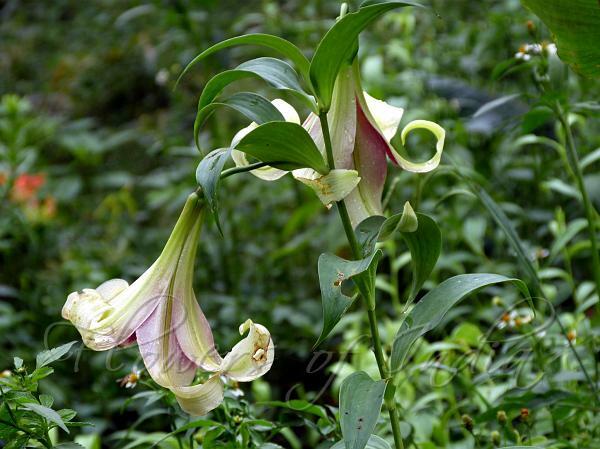 Flowers are few, often solitary, pendant, colored pale green with a purple throat, and scented. Petals are 6-9(up to 13) × 1.6-1.8 cm. Leaves are scattered, lanceshaped or oblong-lanceshaped, 5-10 × 2-3 cm, hairless, 5-veined, margin papillose. 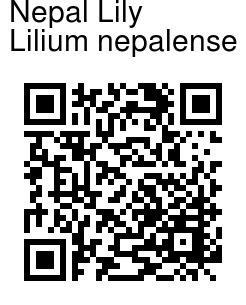 Nepal Lily is found in the Himalayas, from Kumaun to NE India, at altitudes of 2300-3400 m. Flowering: June-July. Photographed at Ganesh Villa, Kalimpong, West Bengal.